Preheat the oven to 200°C, gas mark 6. Heat the butter and 220ml water gently in a pan. Once the butter has melted, bring the water to the boil. Remove from the heat, tip in the flour and a pinch of salt and stir vigorously until the mixture is smooth and comes away from the sides of the pan. Tip into a bowl and, once cold, beat in the egg a little at a time. You may not need all the egg; at the right consistency the pastry should fall reluctantly off the spoon. Lightly grease a large baking sheet. Using a piping bag with a 1.5cm nozzle, pipe 6 x 10cm lengths of pastry onto the sheet. Bake for 20 minutes; transfer to a rack and make a cut in the side of each eclair to allow steam to escape. For the filling, whisk the yolks with half the sugar until thick; stir in the flour. Heat the milk with the coffee and remaining sugar. Slowly pour it into the egg mix, stirring; return to the pan and stir on a medium heat for 2 minutes. Transfer to a bowl; cover with greaseproof paper to stop a skin forming. Once cool, remove and fold in the cream. Split the eclairs and fill. 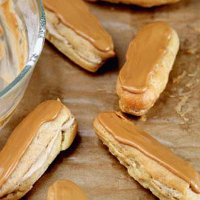 For the icing, stir the coffee into the sugar and spread onto the eclairs. Tuck in straight away, or chill for up to 1 hour.